Disney do some interesting things, and that’s before you even get to the technology. Everyone knows this – you’d have to have been living in a cave like Luke Skywalker not to know Disney. Their art gallery in Downtown Disney is fantastic – with artists giving us brand new spins on old and established characters, and a whole variety of custom printing jobs available. Technology has been something that has been associated with Disney since Pixar first made its debut and probably even before that, but since that point they have also brought Marvel and Lucasfilm into their stable, and this transforms into more than just the movie platform. STEM (Science – Technology – Engineering – Math) for girls programs are becoming extremely popular, and are likely to become even more so as Silicon Valley seeks to ditch the image of a boy’s club that they have accrued. 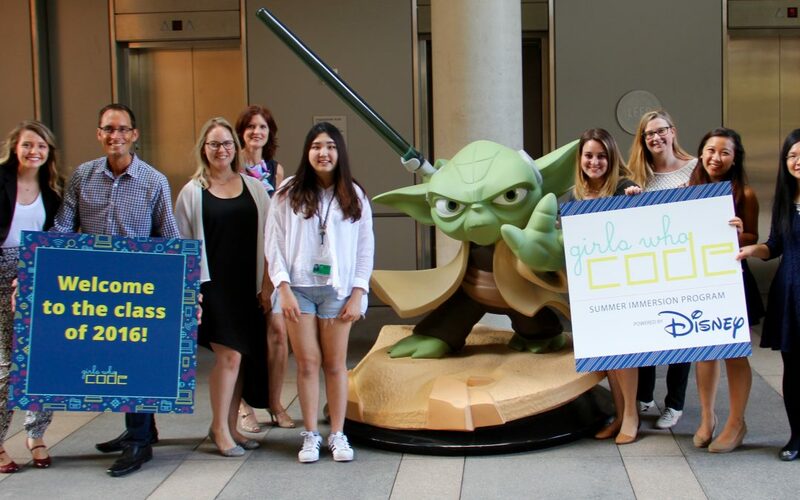 Girls Who Code Summer Immersion Program is something that Disney is offering, which allows girls to see inside the design process for the new Star Wars: Galaxy’s Edge, a new part they are adding to their parks during the next couple of years. The 2017 class also got to hear from Jennifer Lee, who directed Frozen, about not just the technology angle, but also some of the facts about working in a field where women are under-represented. It is definitely something that has been in the spotlight, with films like Hidden Figures telling the stories of women who worked in the rocket program, and stories about women throughout history like Ada Lovelace who published the first algorithm intended for use in Charles Babbage’s Analytical Engine. The tech sector is going through a process of taking a long hard look at the gender inequality and lack of representation of certain groups within its culture. Only 18% of computer science graduates are women, which is a steep decline from the 37% in 1984, and women are only expected to take 3% of the 1.4 million jobs in computer science related fields. STEM seeks to address the imbalance, as do Girls Who Code, and Disney Imagineering. It is a very positive move on the part of these organisations, and one that is sure to pay dividends, whether that be in a better working culture within the industry, or more creative women being able to blow through the obstacles that have traditionally stood in the way of them getting into the fields they want to work in.